One of the things that’s always frustrated me about Google Tasks is that it’s mercilessly tethered to other Google services. You cannot access it by itself; it’s either present through Gmail, Google Calendar, iGoogle or throwing https://mail.google.com/tasks/ig into a Chrome application window. This carries over to Android; while there’s no shortage of apps that support Google Tasks, finding one with polish that has Calendar functionality was pretty difficult. However, Total Agenda is fulfilling my needs beautifully; it’s useful, stylish and has replaced Google Calendar’s default app as the premier organization tool on my phone. What sets it apart is its emphasis on streamlining the task creation and editing process; I’m definitely as fan of this, as I prefer to do as little typing on my phone as possible. 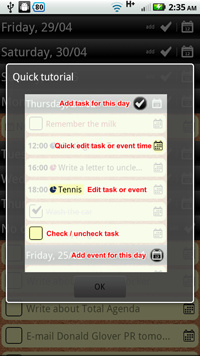 Tasks can be created quickly by hitting the “add [checkmark] button beside the day you want the task to be associated with. As explained by the middle screenshot above, most of the screens that would be traditionally accessed by a “properties” menu inside an individual task listing are instead shunted to the front. This minimizes the amount of clicking around a user has to do in order to manage their tasks. 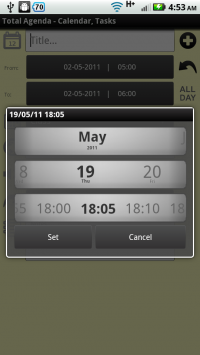 The app also has the primary “calendar” functions, such as reminders and repeatable events support. 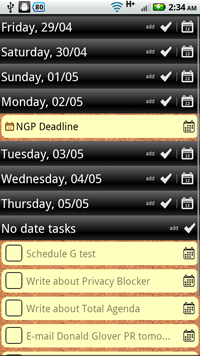 This app is primarily made to be used with Google Calendar, so things sync both ways nicely. My only complaint so far is the unintuitive nature of the time-and-date sliders, as pictured above. It’s very difficult to input a precise time on your first couple tries, and definitely needs patience to work around. Total Agenda is still in Beta, which makes me cringe a little. However, the developers at least have the decency to release their app for free with no type of advertising involved [update: the newest update has brought some ads]; this gives us a clean product to work with until they finalize everything. Total Agenda is a free download from the Android Marketplace, and is worth your time if you use your phone’s calendar for any stretch of time.